VHS has compiled a brief overview of presentations and discussions which have taken place at the CPG on Health Inequalities since September 2015. Contributions have been diverse and informative, and have generated significant engagement from attendees. Notably, attendance has increased significantly at each meeting, reflecting a high level of interest in the chosen meeting topics and the speakers selected to present. VHS was appointed as Secretariat to the Group on 4th June 2015 and proposes to continue this role once the Group is re-registered following the May 2016 Scottish elections. We will contact MSPs in May 2016 to get support to re-register this CPG – once sufficient support has been received, details of the initial meeting of the new term will be confirmed. The summary report below details meetings which covered the topics of housing and health inequalities; health and social care integration and health inequalities, and a spotlight on research into health inequalities. 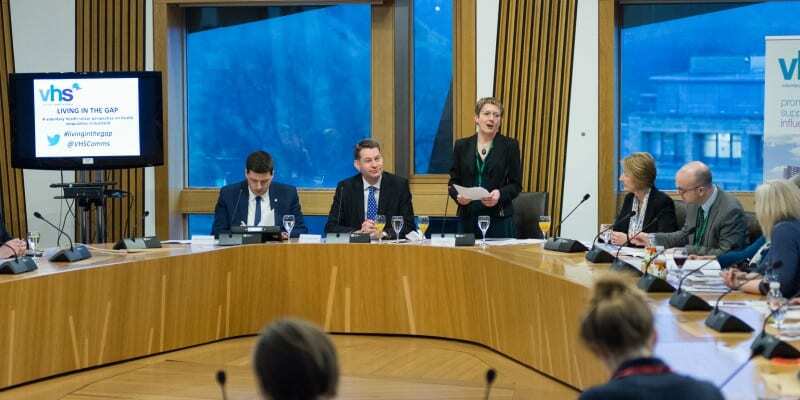 If interested in either joining the CPG as a non-MSP member, coming along as an attendee or speaking at the Group, please email lauren.blair@vhscotland.org.uk.